A Scale Canadian: Sea Blue... International Orange... Over A Prairie State? Sea Blue... International Orange... Over A Prairie State? 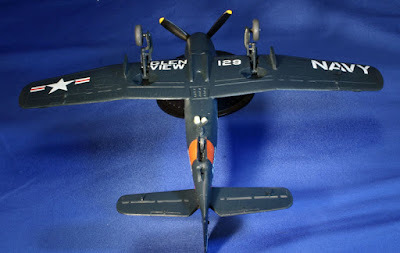 For those of you who felt that my resin Grumman AF-2W Guardian wasn't quite esoteric enough (no pun intended, Rick and Doc) because nearly 200 were built and they had nearly 3 years in active duty service, I present to you my AM-1Q Mauler built from a kit Jim Bates sent me (prior to this gift I, I had long considered Jim a friend). 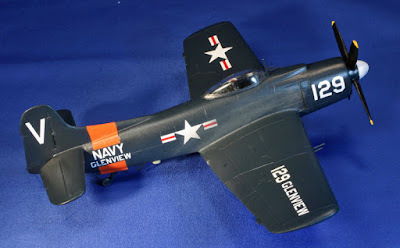 The Mauler was part of the design competition that lead to the development of the AD (A-1) Skyraider. Overengineered, overweight, overpowered for its role, one of them actually tore off its own tail during carrier qualifications. It suffered from the further misfortunes of coming from a company with no modern carrier-based design experience and facing off against an Ed Heinemann design in head to head competition. The first flight was in 1944, as the XBTM-1. The designation was changed to AM-1 in 1946 and first active duty squadron received delivery in 1948. Only about 150 AM-1s were built; they never entered full-fledged fleet service and were out of the regular Navy by 1950. (Given their protracted development, they actually served longer with the Naval Aviation Test Center at Pax River than they did in active duty squadrons!). Eighteen were built as AM-1Q electronic countermeasures planes, meant to provide direct ECM support to attack missions. A second crewman operated the ECM equipment from a dungeon-like hole behind the pilot, where the main fuel tank was located in the attack birds. Reports suggest that NATC found the ECM suite nearly useless. The failure might in part stem from the fact the human factors (now known as ergonomics) for the ECM crewman were horrible. There was one side window, temperatures on the ground were excessive, and even at 25,000 feet (where external temperatures were -50° F) an ordinary flight suit was sufficiently warm. Oh, and egress in an emergency! Well, let's not think about that. The kit is molded typically for a limited run eastern European model. The parts are soft, detail mushy, and casting gates substantial. The soft plastic proved problematic. I ended up with deep gashes from using a too-coarse sanding stick that worked just fine on Esci and Revell-Germany plastic. Scott Van Aken describes the kit in some detail on Modeling Madness. His build-up is here. Others have raised concerns about the accuracy of the landing gear layout, but Google is blacking the SMAKR site right now so be careful. One important omission is the Mauler's distinctive and complicated "finger" dive brake system. I attempted to scribe the dive brake apparatus, but was unable to get the 15 lines evenly spaced and parallel on any one of the 4 surfaces where I attempted it. After filling the failed attempts with Mr. Surfacer, let's just say the dive brakes fit *very* well on the Mauler I've modeled. Overall fuselage fit is not too bad, though the carburetor scoop and wing to fuselage joints are rough. Wings are too thick and seem not to sit quite square. 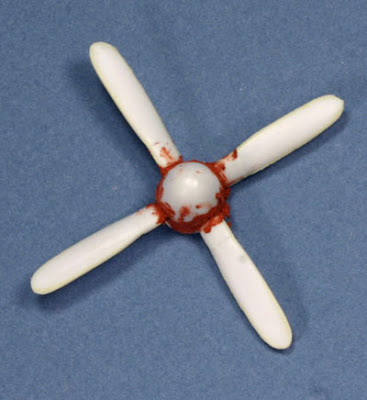 There were no wing pylons were included in my sample (nor called for in the instructions). The pylons were apparently part of a separate weapons set, but the large pylons just outboard of the main gear are structural elements of the wing and not detachable. I scratchbuilt mine from laminated sheets of .030 styrene, based on photo references. The prop is a build it yourself deal, but it did not go well for me. I struggled with it throughout the build and lost most of the detail of the blade cuff through repeated sanding. The interior is acceptable, with nice decals for the panel and consoles. I added decal and wine-foil belts and scratchbuilt the stick to replace the kit-supplied tree trunk. Assembly was otherwise straightforward. The main wheels were utterly atrocious, with the hub standing proud of the tire by a scale 6 inches or so. At first I tried filling the gap with Mr. Surfacer and putty, which would have also brought the tire width closer to scale, but in the end robbed an old (rather brightly colored) Novo/Frog Beaufort of its wheels. They were the only 36 inch wheels with a reasonably correct hub in my spares box. The canopy fit was poor due to the thickness of the plastic and the absence of a significant bevel on its mating surface. I addressed that by wrapping the fuselage with 320 grit sandpaper facing out, and running the canopy back and forth along the fuselage spine. Along with being thick, the clear plastic was also quite hazy. It cleared considerably after a Future dip. 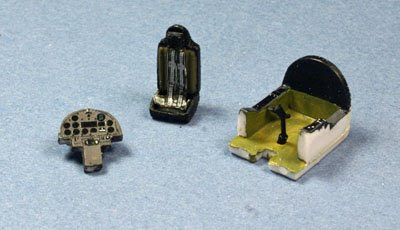 Electronics bulges were carved from sprue scraps and added to the belly, along with a blade antenna and its housing. I left off the tail hook since these were not apparently fitted to the reserve birds. Hypodermic tubes replaced the kits molded 20mm cannons. After the canopy was masked and lightly hit with black from a Tamiya rattlecan, Xtracolor International Orange, lightened slightly with Testors (square bottle) flat yellow was sprayed on the rear fuselage for the "Reserve" band. Even with a lacquer thinner accelerator, I gave the Xtracolor 2 weeks to dry before masking out the band. Then trusty Modelmaster Gloss Sea Blue went on everything. (I probably have more experience with this one paint and shade than any other in my shop.). 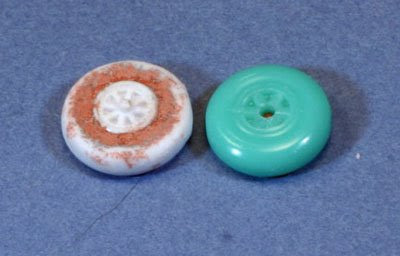 The prop started with Testors rattle can white which was then masked for the spinner. Testors yellow went on the tips. 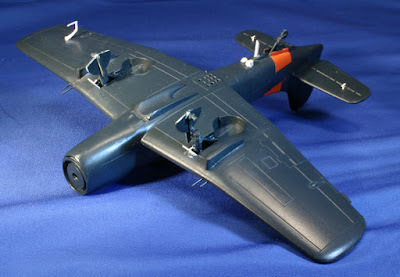 After masking those, Tamiya rattlecan black was next for the blades. Once the blades were masked Gloss Sea Blue went on the spinner base. 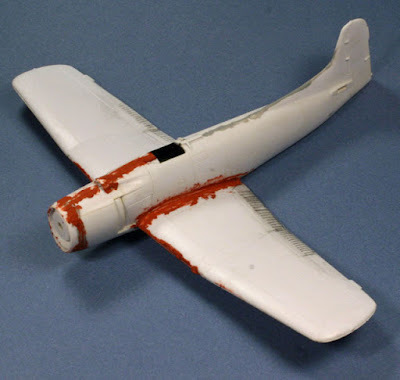 Scratchbuilt radio altimeter antennae were added to the tailplane, new auxiliary gear doors and retraction links replaced the kit ones (which were thick enough to represent battleship armor), and the pitot arm was thinned by 50% and sanded to an airfoil profile. (photo). These were hand painted with GSB, and the ECM bulges were also hand done with Citadel Miniatures Rotting Flesh. The decals were a special treat for me on this one. The AM-1Q's fleet service was very brief, and I could find no photos of active duty Q-birds. Ginter's AM-1 book has numerous shots of Maulers in the reserves. My first goal was to try to do one from Columbus because they carried yellow spinners and had that Ohio link, but I could neither confirm that they operated the AM-1Q there, nor come up with a source for a spelled-out Columbus. Even I, who regularly bangs together parts of Bureau Numbers from individual digits wasn't going to try for C-O-L-U-M-B-U-S by placing single letters in four places. As I was going through my NAVAIR decals for ideas, I found my answer in an unexpected place. Two-Bobs decals did an IPMS Nats 2001 (Chicago) sheet that included an Orange-banded FG-1D from nearby NAS Glenview. The Ginter book has clear photos of AM-1Q 22351 serving at Glenview, and shots of other AM-1's illustrating all angles for markings except the wing upper surface. The lettering sizes for the FG-1D and the AM-1 were the same. I also had the appropriate Aeromaster plain white numbers. We were golden! Very nice kit decals provided basic insigniae and LSO angle markings for the tail. 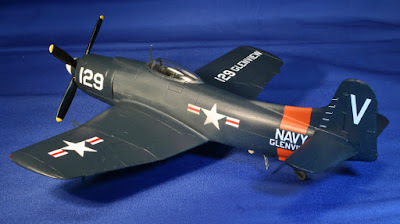 I did have to construct the BuNo from the kit decals and even found a tiny (scale 3 inch) O to serve as the Q in the model identifier above the BuNo. After decaling, I added heavier exhaust staining than is my habit, but I wanted to come close to the photos. The overall finish was toned down by adding a few drops of Tamiya Smoke to Testor's SemiGloss clear lacquer. (Yes! They are compatible, a fact I learned in the ARC forums). The canopy was unmasked (no disasters, Yay!) and buffed with an old T-shirt rag. The radio aerial at the windscreen was sliced from .010 plastic, painted GSB, and attached. For ease of handling and storage, I did not rig the antenna lines. After a long, and mostly fruitful journey, I was done. Though it photographs nicely, there are errors in abundance including residual sanding gouges, significant malalignments, and even some open seams. Much like its 1:1 scale ancestor, it serves best toward the back of the shelf. Jim, If you and Mr. G agree, I'd love it if you'd send me this review and the photos for use in our club newsletter. Interesting post... Looks like solid state memory is finally starting to take off. Hopefully we'll start seeing decreasing solid state harddisk prices soon. 5 dollar 32 gigabyte Micro SDs for your DS flash card... imagine that!